USES: Sumatriptan is used to treat migraines. It helps to relieve headaches, pain and other symptoms of migraines, including sensitivity to light/sound, nausea, and vomiting. Prompt treatment allows you to get back to your normal routine and may decrease your need for other pain medications. Sumatriptan does not prevent future migraines or reduce how often you may get a headache. Sumatriptan belongs to a group of drugs called triptans. It affects a certain natural chemical (serotonin) that constricts blood vessels in the brain. It may also block other pain pathways in the brain. HOW TO USE: Read the Patient Information Leaflet available from your pharmacist before you start using sumatriptan and each time you get a refill. Ask your doctor or pharmacist if you have any questions. Take this medication by mouth, with or without food, at the first sign of a migraine. If there is no improvement in your symptoms, do not take any more doses of this medication before talking to your doctor. If your symptoms are only partly relieved, or if your headache comes back, you may take a second dose after two hours or as directed by your doctor. Do not take more than 200 milligrams in a 24-hour period. This medication may also be used as a backup for sumatriptan injections. If your symptoms are only partly relieved or your headache returns, 2 hours after the injection you may switch to sumatriptan taken by mouth instead of using a second injection. After the initial injection you may take sumatriptan by mouth every 2 hours if needed to a maximum of 100 milligrams of tablets in a 24-hour period. If you have never taken this medication before and you have risk factors for heart disease (see Precautions), you may need to be monitored for rare but serious side effects (e.g., chest pain) when you take the first dose. Your doctor may ask you to take the first dose in the office. Your dosage is based on your medical condition and response to therapy. Tell your doctor if your condition does not improve or if it worsens. Overuse of drugs to treat sudden migraine attacks can lead to worsening of headache (medication overuse headache) or rebound headache. Therefore, do not use this medication more often or for longer than prescribed. Tell your doctor if you need to use this medication more often, if the medication is not working as well, or if you have more frequent or worse headaches. Your doctor may need to change your medication and/or add a separate medication to help prevent the headaches. SIDE EFFECTS: Flushing, sensations of tingling/numbness/prickling/heat, weakness, drowsiness, or dizziness may occur. If any of these effects persist or worsen, notify your doctor or pharmacist promptly. Remember that your doctor has prescribed this medication because he or she has judged that the benefit to you is greater than the risk of side effects. Many people using this medication do not have serious side effects. Chest/jaw/neck tightness can commonly occur shortly after using sumatriptan. Only rarely are these signs of a serious condition. However, you may not be able to tell it apart from a serious reaction related to a lack of blood flow to the heart, brain or other parts of the body. Seek immediate medical attention if any of these unlikely but very serious (rarely fatal) side effects occur: chest pain, jaw/left arm pain, fainting, fast/irregular/pounding heartbeat, vision changes, weakness on one side of the body, confusion, slurred speech, sudden or severe stomach/abdominal pain, bloody diarrhea. Tell your doctor immediately if any of these unlikely but serious side effects occur: blue fingers/toes/nails, cold sensation of hands/feet, hearing changes, mental/mood changes, seizures. This medication may rarely cause a very serious condition called serotonin syndrome. The risk increases when this medication is taken with certain other drugs such as other "triptans" used to treat migraine headaches (e.g., rizatriptan, zolmitriptan), certain antidepressants including SSRIs (e.g., citalopram, fluoxetine, paroxetine) and NSRIs (e.g., duloxetine, venlafaxine), or a certain drug to treat obesity (sibutramine). Before taking this drug, tell your doctor if you take any of these medications. Serotonin syndrome may be more likely when you start or increase the dose of any of these medications. Seek immediate medical attention if you develop some of the following symptoms: hallucinations, unusual restlessness, loss of coordination, fast heartbeat, severe dizziness, high fever, severe nausea/vomiting/diarrhea, twitchy muscles. A serious allergic reaction to this drug is unlikely, but seek immediate medical attention if it occurs. Symptoms of a serious allergic reaction include: rash, itching/swelling (especially of the face/tongue/throat), dizziness, trouble breathing. This is not a complete list of possible side effects. If you notice other effects not listed above, contact your doctor or pharmacist. In the US - Call your doctor for medical advice about side effects. You may report side effects to FDA at 1-800-FDA-1088. In Canada - Call your doctor for medical advice about side effects. You may report side effects to Health Canada at 1-866-234-2345. PRECAUTIONS: See also How to Use section. Before using sumatriptan, tell your doctor or pharmacist if you are allergic to it; or to other triptan drugs (e.g., zolmitriptan, rizatriptan); or if you have any other allergies. This product may contain inactive ingredients, which can cause allergic reactions or other problems. Talk to your pharmacist for more details. This medication should not be taken if you have certain medical conditions. Before using this medication, consult your doctor or pharmacist if you have a history of: heart disease (e.g., chest pain, heart attack), decreased blood flow in the brain (e.g., stroke, transient ischemic attack), blood circulation disease (e.g., ischemic bowel disease), uncontrolled high blood pressure (hypertension), certain types of headaches (hemiplegic or basilar migraine), liver disease. Before using this medication, tell your doctor or pharmacist your medical history, especially of: certain blood circulation disorders (e.g., Raynaud's disease), seizures. Tell your doctor if you have the following risk factors for heart disease: diabetes, family history of heart disease, high blood pressure (controlled), high cholesterol, overweight, smoker, female after menopause, male over age 40. If you are at high risk for heart disease, your doctor may want to check your heart before prescribing sumatriptan. This drug may make you dizzy or drowsy. Do not drive, use machinery, or do any activity that requires alertness until you are sure you can perform such activities safely. Limit alcoholic beverages. The risk of heart disease, liver disease, and high blood pressure increases with age. 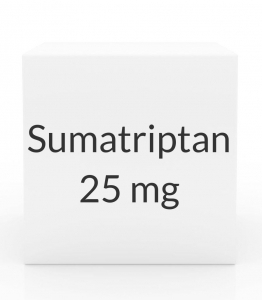 The manufacturer does not recommend the use of sumatriptan in the elderly since they may be more sensitive to the side effects, including an increase in blood pressure. This medication should be taken only when clearly needed during pregnancy. Discuss the risks and benefits with your doctor. This drug passes into breast milk and may have undesirable effects on a nursing infant. Avoid breastfeeding for at least 12 hours after taking sumatriptan. Consult your doctor before breast-feeding. DRUG INTERACTIONS: See also Side Effects section. Your healthcare professionals (e.g., doctor or pharmacist) may already be aware of any possible drug interactions and may be monitoring you for it. Do not start, stop or change the dosage of any medicine before checking with them first. This drug should not be taken with the following medication because very serious interactions may occur: a certain weight loss drug (sibutramine). Do not take this medication if you are taking MAO inhibitors (isocarboxazid, linezolid, methylene blue, moclobemide, phenelzine, procarbazine, rasagiline, selegiline, tranylcypromine) or have used MAO inhibitors in the past 2 weeks. In some cases a serious, possibly fatal, drug interaction may occur. If you are currently using any of these medications listed above, tell your doctor or pharmacist before starting sumatriptan. Before using this medication, tell your doctor or pharmacist of all prescription and nonprescription/herbal products you may use, especially of: certain types of antidepressants (e.g., SSRIs such as fluoxetine/paroxetine/sertraline, NSRIs such as venlafaxine). If you also take any ergotamine medication (e.g., dihydroergotamine or methysergide) or any other "triptan" drugs (e.g., zolmitriptan, rizatriptan), you will need to separate your sumatriptan dose from your dose of these other medications in order to lessen the chance of serious side effects. Ask your doctor how long you should wait between your doses of these drugs. Also report the use of drugs which might increase seizure risk (decrease seizure threshold) when combined with sumatriptan such as isoniazid (INH), phenothiazines (e.g., thioridazine), theophylline, or tricyclic antidepressants (e.g., amitriptyline) among others. Consult your doctor or pharmacist for details. This document does not contain all possible interactions. Therefore, before using this product, tell your doctor or pharmacist of all the products you use. Keep a list of all your medications with you, and share the list with your doctor and pharmacist. NOTES: Do not share this medication with others. Certain foods/beverages or food additives (e.g., red wine, cheese, chocolate, monosodium glutamate) as well as some lifestyle patterns (e.g., irregular eating/sleeping habits, stress) may bring about a migraine headache. Avoiding these "triggers" may help decrease the frequency of migraine headaches. Consult your doctor for more details. STORAGE: Store the US product between 36-86 degrees F (2-30 degrees C) away from heat, light and moisture. Store the Canadian product at room temperature between 59 to 86 degrees F (15 to 30 degrees C) Do not store in the bathroom. Store this medication in its undamaged original packaging, and do not remove the tablet from its packaging until you are ready to take it. Keep all medicines away from children and pets. Do not flush medications down the toilet or pour them into a drain unless instructed to do so. Properly discard this product when it is expired or no longer needed. Consult your pharmacist or local waste disposal company for more details about how to safely discard your product.